After 9 months I am still going strong and May was an amazing month. Everything I did in the last month has really paid off. Now I am really searching for new ways to keep this growth going. I must apologize, though, because eventhough I am really close to finfishing the e-book, it is still not done yet. There is just so much I want to include and tell you about. 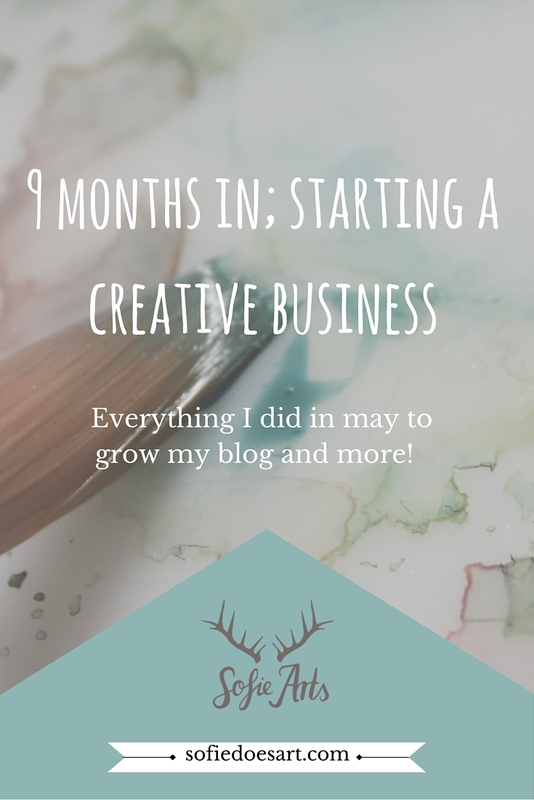 Even though I made none of my goals for my blog this month I still think this was a very exciting month. My blog is growing and thriving. I have found working and easy ways to share my blog posts and get traffic. The most amazing thing this month was that I made my secret goal. I made it to 1000 views this month! I am so excited, thankful and happy to share this. Blogging is definitely something you are in for the long haul. But when you keep going you will definitely see results! Keep finding new ways to grow! Pinterest is finally starting to work for me. It is not overwhelmingly good but I think that is mostly because I haven’t worked on it so much! The main thing I learned is that you should pin a lot! For Tumblr I shifted a lot with my blogs, moving some things around and such. I think that the way I organised it now is much better. After a little art session with one of my best friend, I feel like I have been drawing some more again. At the moment, I am working a lot digitally and in oil paint. The gallery on my blog will make it a lot artsier hopefully so people can feel the vibe more! The Friday posts do really help as well. Etsy has been not very good. I have been blundering and stopped promoting it and I have not been creating the kind of work I want to sell. Now I want to make one last batch, try one more time but if it doesn’t work I will try a different route. I also am thinking about creating an online class. I am thinking about either a colour class or some creature design. But since these are a lot of work I am not sure how or when. I was really inspired to do this by my amazing friend Romica. She teaches skillshare classes that are simply incredible. I already did one and now we are making gouache animal illustrations and it is just so much fun! I so hope you check them out! So that was month 9 and all the ins and outs. I hope this series gives you an insight into what it all takes to make a creative business from scratch with no prior knowledge. I am really happy with any suggestions and input so do let me know. I’m so excited to see what is working for you. I would also suggest that I have noticed quality over quantity works on Instagram even if Instagram experts so post more I am noticing for artists if you are really good you don’t need to post all the time. And I post all the time and can’t level my followers. On Pinterest I watched an Etsy seller video saying pin more of your own stuff but there’s only so much you can create. Today I discovered a good artist who loads his pins up with hashtags. That used to be a no no. I put a few in and will keep doing that to see if it drives traffic. The video said do you want tonnes of followers or to drive traffic? Hope this helps! Glad to see that you are making progress, I am sure it is a big learning curve. To reach your goal is not always a straight line, I read that somewhere and it is true. I am sure that Pinterest advice is the same for arts as it is for most categories on Pinterest. Have you checked out my co-host Julie she is so inspiring? She is big into Pinterest and business. Just her attitude can teach us a lot. Thank you so much for the inspiring words. I love to share these posts because I always get great advice. I should definitely read more from Julie. She is indeed a amazing blogger!